2. For poached eggs, bring a pot of salted water to boil, add vinager and simmer. Gently add one egg at a time and cook for two – three minutes, depending on how runny you like your eggs. 3. 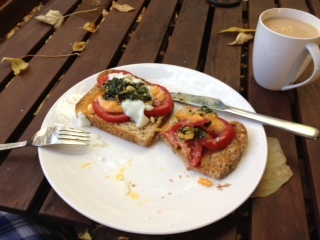 Meanwhile, toast bread, pace tomato on bread and spoon pesto on top. Place one egg per toast and add salt and pepper. Podría ser para nuestros desayunos,se ven deli,felicitaciones,estas mejorando cada dia mas.